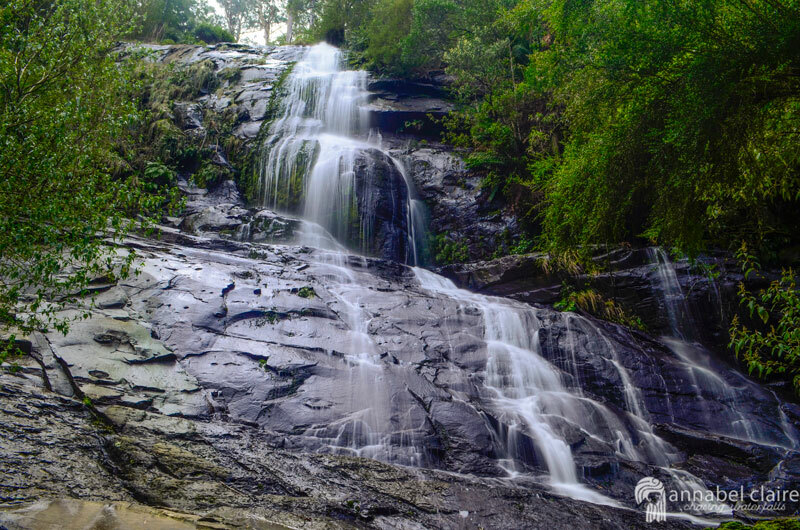 Many who visit the well-known Erskine Falls in Lorne are oblivious to the impressive Straw Falls, just 400 meters further along the river. I made it my mission to find them during a four day trip down Great Ocean Road in which I attempted to visit 15 waterfalls. Yes, 15 waterfalls in four days. I know, I’m insane. But I did it. I’d been shooting Erskine Falls, my gumboots slipping and sliding on the mossy rocks into icy cold water, when I spotted him. Brad Royce, a fellow Instagram photographer (BWR photography) whom I had never met. So how did I know it was him? Well, his huge beard was unmissable, resembling his Insta profile picture. I think he recognised me first, however, because I was dressed in a rather oversized, bright yellow raincoat we had talked about taking photos with. I introduced myself with ease, and we instantly felt like old photography mates. I love those kind of friendships. So when I suggested we set off to find Straw Falls, Brad was just as enthusiastic as me. To find Straw Falls, you follow the edge of the Erskine River. At the bottom of the staircase down to Erskine Falls, there is a smaller staircase off to the right that leads down onto the bank. Once down here, you need to cross the river to the left-hand side to follow the thin, windy, muddy path. I wobbled and stumbled through the cold water, juggling my backpack and camera bag, thanking my lucky stars that the water levels weren’t too high (if they were, I’d imagine you wouldn’t be able to cross). Even in my Hunter gumboots, it was difficult. Though Brad didn’t seem to have any trouble, rushing ahead in his sneakers. The air was crisp, but not too cold. September had brought slightly warmer days, but not so warm that the waterfalls had dried up. I guess you could call it perfect. We meandered along the river bank, squinting our eyes at times to figure out where the path actually continued. The track isn’t exactly well-kept, and we had to step over thick tree roots, mossy logs and rocks. Overlaid with lush, green ferns, at times it was dark and magical. And yet in others, it opened up to reveal the sky. That’s the beauty of a trek along the riverbank – you never know quite what to expect. Following the river is also somewhat comforting. The gushing, fresh water right next to me assured me that I was travelling in the right direction. At times, it can be confusing to figure out which path is actually the track, but as long as you follow the stream, you’ll get there in the end. And besides, venturing into the unknown and feeling that sense of uncertainty is part of what makes finding your destination so satisfying. And sure enough, soon we saw the falls peeking through the ferns. Ducking under one last, fallen tree-trunk, the path suddenly turned to stone. I gasped in disbelief. I’d done my best Instagram stalking trying to see a shot of these falls so I knew what to expect, but I had no idea they were so large. The rock is a sheer drop, right in front of you. It was great having Brad there to press the shutter release button for me on my camera – and having me in the picture really puts the size of the falls in perspective, don’t you think? They were far more impressive than I had imagined. We spent some time setting up tripods and trying desperately to get some angles that do the falls justice. I won’t lie – it was tricky. But rewarding. After we were finished shooting, I suggested to Brad that we attempt to find Splitter Falls, which were apparently about another kilometer further along the river. At Straw Falls, it appears the track has ended, however if you search through the fallen debris, you’ll eventually make out the path. It continues along the river, so we headed that way – head there with us! Walking distance 400 meters from Erskine Falls (one way) Total 2.2km return.